The Lotus Discovery Server is a knowledge server. It provides search and expertise location solutions designed to ensure that the relevant knowledge and collective experience of an organization is readily available to help individuals and teams solve everyday business problems. 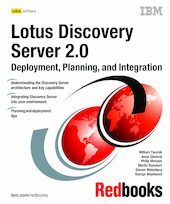 In this IBM Redbooks publication we provide an in-depth discussion of the architecture and capabilities of the newest release of the Discovery Server - Discovery Server 2.0. We discuss the key aspects involved in planning for the deployment of this product, from both organizational and technical viewpoints. We also discuss: the key elements of a solid infrastructure design to ensure scalability and reliability, development and maintenance of an enterprise taxonomy, integration of Discovery Server into your existing environment and applications, use of the Discovery Server API toolkit, and ongoing Discovery Server maintenance. This book is appropriate for technologists and project managers who are involved with Lotus Discovery Server-related projects.